Back in January 2010 when I launched this site, I laid out the things it could lead to on a continuim from low to high. On the low end was “Nobody likes it, everybody dies.” On the very top of the high end was “Book deal, everyone lives” and close behind that was “Someone hires me to write magazine articles about this stuff.” Well, there’s still no book deal but a few months ago GamePro’s John Davison contacted me saying that he liked the site and wanted to know if I was interested in writing for the GamePro print magazine. After I finished fist pumping, I said that I most definitely was. Just look for the murderous Alice and you'll find it. Psychologists actually have models of what anonymity tends to do to people because they’ve been studying its effects long before the first person ever rage quit a game of Pong. While little of that early research involved video games, it did employ painful electric shocks, children in Halloween costumes, and college co-eds dressed up as nurses –sometimes two of those things at the same time. …But is “antisocial” our default mode when we bring up a web browser or multiplayer menu? Is donning a virtual version of Jack’s face paint by adjusting the “brow height” slider on a character creation tool sufficient in and of itself to make us punt all morals out the window? Psychologists say no, it’s not. According to recent research on the topic, there are additional factors at play, which redefine the whole issue. I had written a bit on deindividuation and anti-social behavior here, but while conducting actual research for the article I found out that I didn’t know the entire story with the current state of research on deindividuation and anonymity. You can read the GamePro article for the whole thing, and if they ever put ito n GamePro.com I’ll certainly link to it there as well. All in all it was a fun experience writing the article, with the not unsubstantial bonus that they paid me to do it. When the anonymity piece was done my editor Patrick went on to assign me a second article, which has at this point also been written, turned in, and scheduled to appear in next month’s issue. 1 And as of this moment I’m working on a third piece, so apparently they like what I’m doing well enough so far. If you like the anonymity piece or have something else interesting to say about it, please let GamePro know at feedback@gamepro.com. If you don’t like it, then write your Senator or something. I dunno. While we’re on the topic, though, I really like changes that GamePro has made to its print magazine in the last several issues. They seem to realize that they can’t compete with websites for timely content or reviews, so they seem to be going for more in-depth stories that require some actual research and reporting. Stuff like the history of GameStop, the impact of Metacritic on the gaming scene, the nature of bug testing in games, the impact of piracy on the games industry, and more. I’ve been published in “legitimate” outlets both online and in print before, but I’m still happy to be in the pages of GamePro. Blogging dreams do come true! Plus it’s nice that nobody has to die. 1. Print scheduling lag is weird. I know this is going to sound corny, but you have literally given me the impetus to subscribe to a print mag for the first time in YEARS. I’m interested to see what a general interest print mag for gaming looks like after a decade of hardware reviews and exposes on the internet. Speaking of print scheduling lag, seeing the little text ” The first issue will arrive at the address below in 4 to 6 weeks” brought me back! Where’s instant gratification when you need it? Does the research, or your article address the difference between anonymity and pseudonymity? If not, I’d love to see a post about it. (Says the guy who’s had a consistent pseudonymous presence on the internet for close to ten years). By the way, I wouldn’t be waiting for someone to offer you a book deal. Did you get republication rights to your articles for GamePro? I really enjoy reading your blog and I’m glad you get the props you deserve by GamePro! Congratulations, that’s awesome. Everyone here knew you were on to a great idea and I really enjoy that you bring some sophistication to Gaming. We need people to see there is another side to games besides moms basement and blowing some guys face off with a BFG. No, I’m not familiar with the concept of pseudonymity. Sounds like something that folks looking at virtual worlds would study? And while there’s some wiggle room with the GamePro articles, generally the deal is that they own them. That’s what the money is for. Awesome. 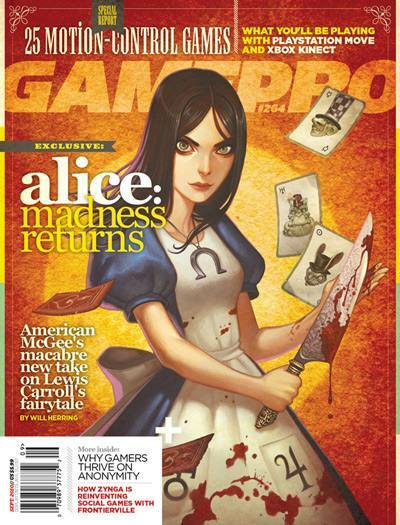 Just like Adam I’m tempted to get GamePro for the articles, especially if they are doing more in depth stuff. Yeah, you should at the very least go thumb through an issue and see the kind of stuff they’re doing. Their reworking of their reviews section is also an improvement, though I think they have some stylistic issues to work through on the writing of those pieces. That’s great news, you deserve it too – this blog is very original and very useful. My company is currently doing quite a lot of social gaming development and it’s great to be able to come here to get articles that can be used to discuss the merits of various ideas. That is wonderful. Now to figure out where I can pick up the magazine. While I initially added your blog to my reader because I was interested in the topic your writing style makes it a real pleasure to read. It was smart of them to hire you to write. Congrats, Jamie! Your blog has had a lot of success in only 8 months. I suspect it is because no one else (that I’ve ever found) writes so well and with such detail that you do about the psychology of video games, which is an interesting topic.